Special guests visit The Cheese Plate PDX, May 2013, Portland, Oregon, U.S. Photo courtesy of The Cheese Plate PDX. Inspired by Lama Zopa Rinpoche’s message to students in FPMT Annual Review 2011: Cherishing Life, FPMT International Office’s Carina Rumrill – former editor of Mandala and present editorial support for the office – and her partner, Nick Dickison, took their extensive experience in fine dining, combined it with Portland, Oregon’s increasingly popular food cart scene and created The Cheese Plate PDX. The high-end-style food cart has a carefully thought-out vegetarian menu, with many vegan choices, that reflects the importance Rinpoche places on a vegetarian diet. Over the past year, The Cheese Plate PDX, whose tagline is: “enjoy yourself. cherish others.” has received national acclaim, being featured in Food Network Magazine and Zagat’s Top Ten Restaurants in the Alberta Arts District. Their recipes have been featured in Trailer Food Diaries Portland Edition, a collection of recipes from Portland’s best food carts, and the cart has also received positive attention from local publications and bloggers throughout Portland. 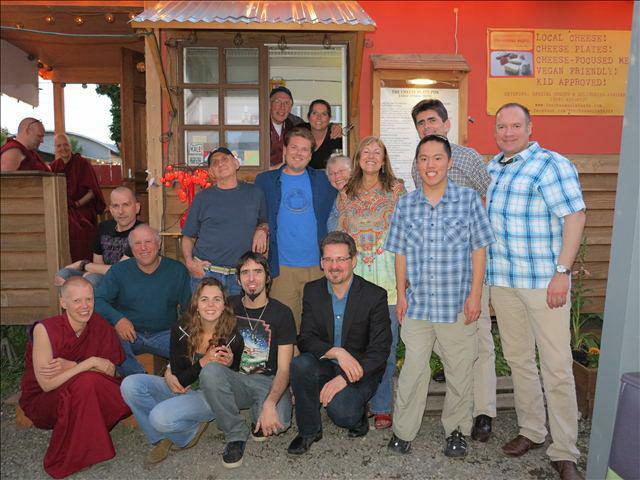 In May 2013, they were thrilled by a special visit from their FPMT family which included Tenzin Ösel Hita, his partner Maï, members of the FPMT board of directors, Nick Ribush of Lama Yeshe Wisdom Archive, and other FPMT friends, International Office coworkers and Sangha. Recently, The Cheese Plate PDX went up against five other well known food carts in a recipe contest featuring a local jelly called Kelly’s Habañero Pepper Jelly. They won first place. 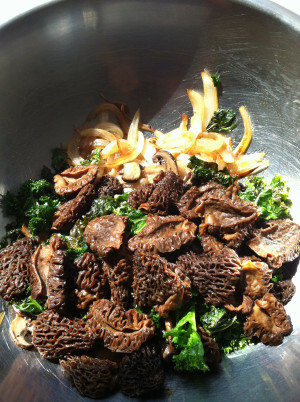 The start of mushroom and kale pâté from The Cheese Plate PDX. Photo courtesy of The Cheese Plate PDX. This delicious, earthy spread can be made vegan (like we serve at the cart), or not, with regular cream cheese. In a large sauté pan cook onions in a small amount of olive oil, about 1/4 tablespoon (4 mL), over medium heat until soft and starting to caramelize. Remove from the pan and set aside to cool. In the same pan cook the mushrooms, again over medium heat with a small amount of oil, until they’ve released all their liquid and are starting to take on some color. Add the sherry and cook out the alcohol, about 2 minutes, then remove from pan and set aside with the onions. Return the pan to high heat, add another small amount of olive oil and allow to heat for a minute. Put the kale in the pan, sauté for a couple minutes stirring often, then add a half ounce (15 mL) of water and continue stirring until the kale is tender and bright green in color. Remove from the pan and let cool. Start with the sunflower seeds in a food processor, pulse a few times to chop them small but not too fine. Add mushrooms, onions, kale, cream cheese and chili flake, puree until smooth, adding a drizzle of olive oil if pâté is too thick. Remove from food processor into a mixing bowl and season with salt and pepper to taste. Yields about 1 pint (118 mL). Serve with crackers, crostini or bagels. Also delicious with sliced vegetables like cucumber rounds. Carina and Nick are working on a cookbook featuring a year’s worth of their vegetarian and vegan recipes. Look for it early 2014!